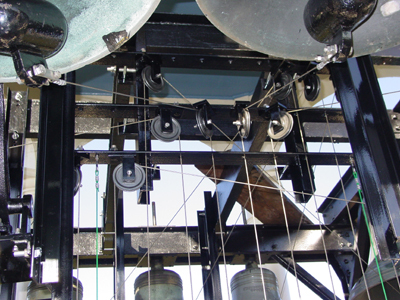 This 10-bell Meneely Bell Co. chime was renovated by us in 2005. 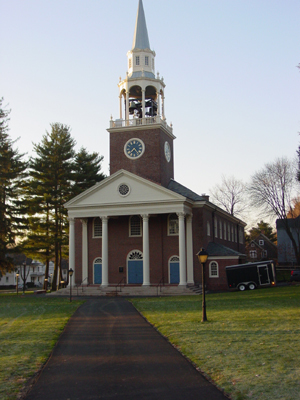 The renovation was occasioned by the general renovation of the Seymour St. John Chapel at this historic private school. 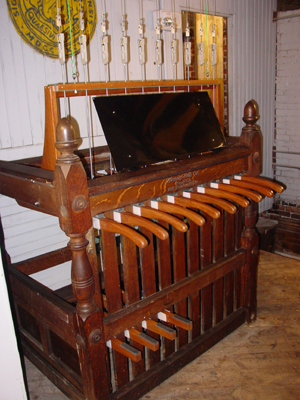 We first disassembled the chime, rigging out the bells and they were placed in storage on campus; the gravity clock hammers and their pulleys, and the existing chime clappers and headpieces, along with the chiming levers and pedals of the chimestand were removed to our foundry for restoration. Upon examining the chime levers and pedals in detail, we felt these were too badly water-damaged and worn, and so we milled entirely new chiming levers and pedals; anti-friction bushings were made for the operation of the keys and pedals, a new stop rail and new composite stop pads were furnished; new stainless pull rods for the pedal and manual action, new clevis sets and carillon-type adjusters were also furnished. 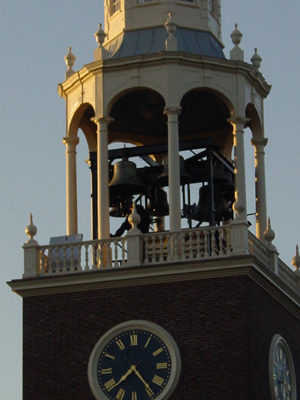 The clappers and headpieces were renovated, and the bells rehung with new stainless steel bolts and Neoprene isolation in the existing steel bellframe, which had been cleaned and painted by others while the bells were removed. Many deteriorated planks upon which the chiming hammers and chime pulleys were originally mounted were removed; we built all new steel mountings for the clock hammers, and designed and built a new sealed stainless steel ball bearing pulley action system and action frame; we also built a new umbrella rack and umbrellas, and renovated the existing clock hammers and hammer pulleys. 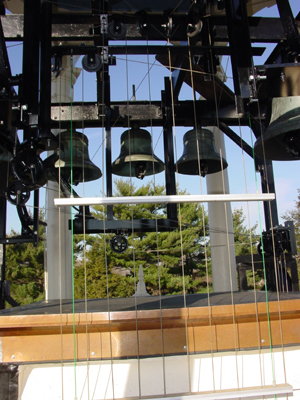 We reinstalled the chime in the tower with all renovated and new equipment, and adjusted in playing order, reconnecting the hammers with new cables to the existing Seth-Thomas tower clock.